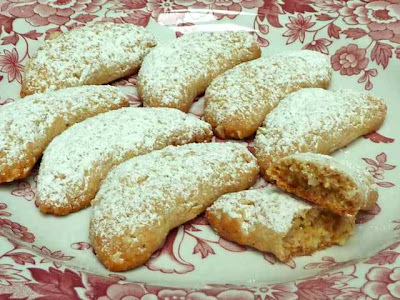 These cookies are buttery and tender with a wonderful almond flavor. With this blend of flours it is indistinguishable from the regular wheat version. I cut it out of a magazine many moons ago and today I decided to finally make it. It is raining here on the Jersey Shore and it is a good day to bake. I love the flavor of almond in cookies. These crescents are soft, not too sweet and irresistible. These have no eggs so they can be easily made vegan or dairy free, but I made the butter and cream cheese version today. This is fairly easy to make. You may want to add more almond extract if you prefer a stronger almond flavor...maybe 1/2 tsp. more. I used less sugar than the original recipe since I tend to prefer less sweet desserts and these are dusted with powdered sugar when done. Preheat the oven to 350 degrees. Prepare baking sheets by lining them with parchment paper or silpat liners. Chop the blanched slivered almonds in a nut grinder until finely chopped. I ran the nuts through about 5 times. After chopping there were 2/3 cups nuts. 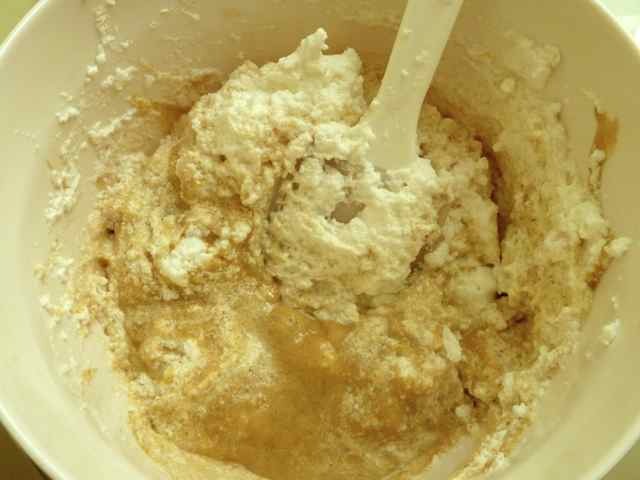 In a small bowl add the flours, xanthan gum, baking soda and salt and mix well. In a large bowl add the cream cheese, butter or margarine, sugar, vanilla and almond extracts and mix well with an electric mixer. Add the flour mixture, all at once, to the sugar mixture and mix well. Add the nuts and knead into the dough. Nuts ready to be mixed into the dough. 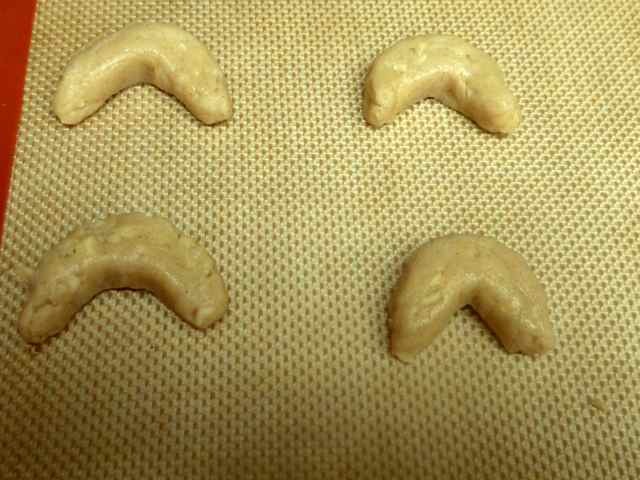 With a scoop that measures 1-inch across scoop out balls of dough, 2-inches apart, onto the prepared baking sheets. 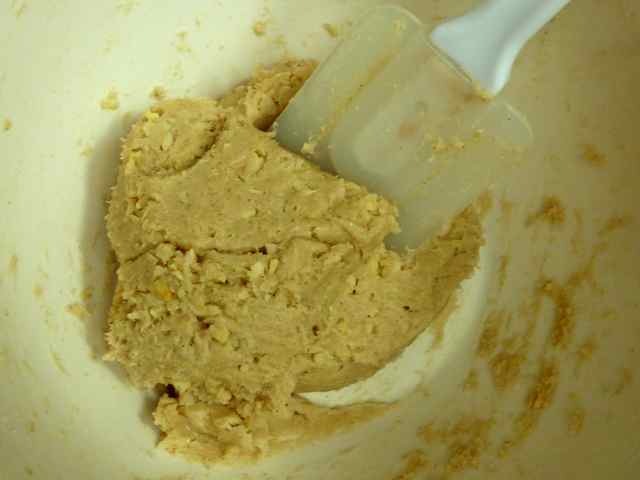 Dough with nuts mixed in. 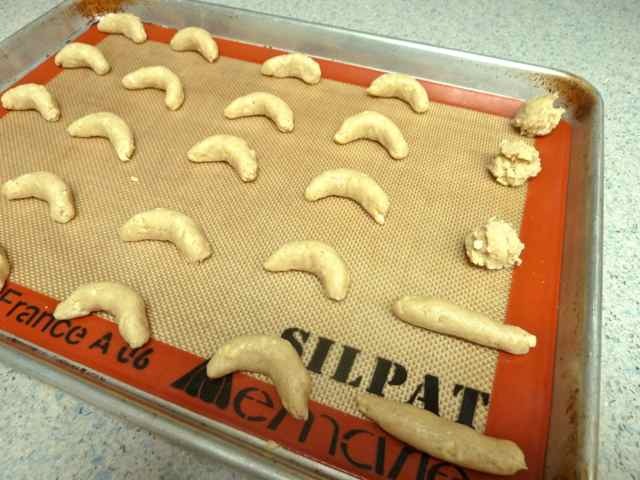 Roll each dough ball into a rope shape and then shape each rope into a crescent shape. ropes shaped into crescents on the left. Cool slightly on wire racks and dust with powdered sugar. 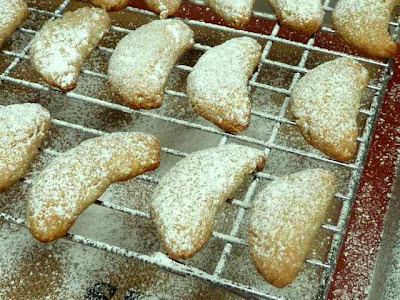 Dusting cookies with powdered sugar. Cool completely and store in airtight containers or tins lined with wax paper. 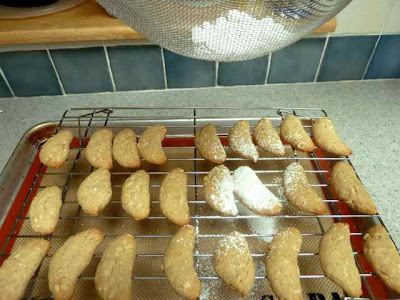 GLUTEN FREE ALMOND CRESCENT COOKIES Makes about 60 cookies. Ingredients 6 oz. Cream Cheese (for Dairy-Free or Vegan use non-diary cream cheese) 3/4 cup Unsalted Butter (for Dairy-Free or Vegan use non-hydrogenated non-dairy margarine) 3/4 cup Sugar (for Vegan use Vegetarian sugar) 2 tsp. Vanilla Extract (for Vegan or Dairy-Free use 1 tsp. of vanilla and 1 tsp. of Butter Vanilla emulsion, if you have it) 1/2 tsp. Almond Extract (use 1 tsp. 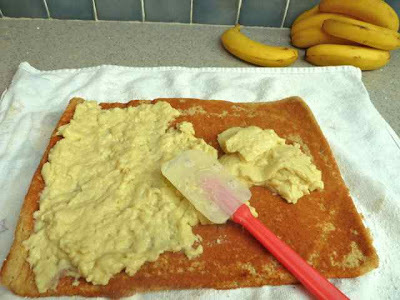 if you prefer a stronger almond flavor) 1 cup Sorghum Flour 1 cup Tapioca Flour 1/4 cup Chickpea Flour 1 tsp. Xanthan Gum 1/4 tsp. Sea Salt (omit the salt if your butter or margarine is salted) 1 tsp. 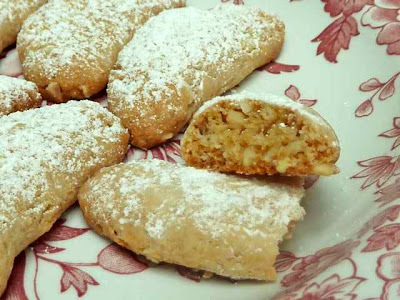 Baking Soda 1 cup Slivered Almonds - finely chopped (comes to 2/3 cups when chopped) 1/4 cup Confectioner’s or Powdered sugar - for dusting baked cookies Directions Preheat the oven to 350 degrees. 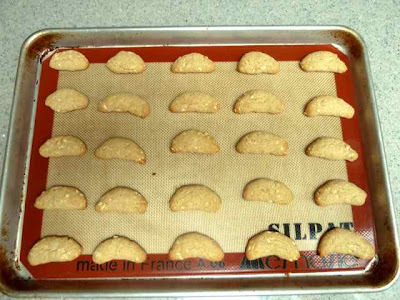 Prepare baking sheets by lining them with parchment paper or silpat liners. Chop the blanched slivered almonds in a nut grinder until finely chopped. I ran the nuts through about 5 times. After chopping there were 2/3 cups nuts. In a small bowl add the flours, xanthan gum, baking soda and salt and mix well. In a large bowl add the cream cheese, butter or margarine, sugar, vanilla and almond extracts and mix well with an electric mixer. Add the flour mixture, all at once, to the sugar mixture and mix well. Add the nuts and knead into the dough. With a scoop that measures 1-inch across scoop out balls of dough, 2-inches apart, onto the prepared baking sheets. Roll each dough ball into a rope shape and then shape each rope into a crescent shape. Flatten each crescent slightly. Bake for 10-12 minutes or until lightly browned. Cool slightly on wire racks and dust with powdered sugar. Cool completely and store in airtight containers or tins lined with wax paper. 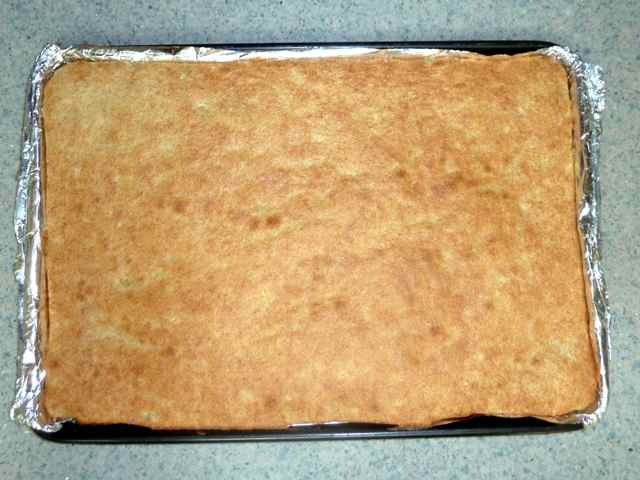 This cake is moist, light and flavorful. You can fill it with just jelly or use jam, preserves or fruit filling. 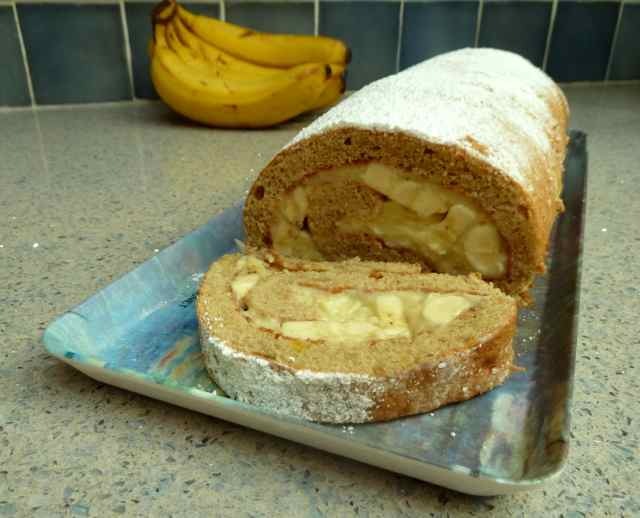 Whipped cream, frosting, pudding or whipped toppings can also be used to fill the cake either by themselves or with some fruit filling or jelly. 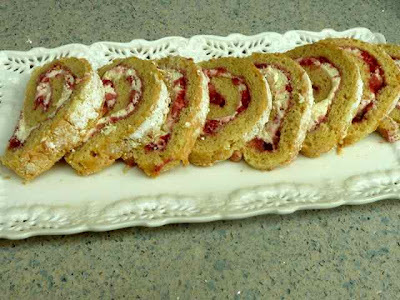 I found this recipe, Grandma Chrs Jelly Roll, on food.com. I converted it to gluten free, reduced the sugar and used some almond and vanilla extracts. I just bought some organic strawberries so I decided to use them to make a cooked fruit filling and I also used fresh whipped cream to fill it. The cake came out well. The texture is indistinguishable from a cake made with regular white flour. The strawberry and whipped cream filling has a rich natural flavor and is a fitting homage to Strawberry Shortcake. Prepare a Jelly Roll pan (10x15x1-inch) by lining it with aluminum foil and greasing the foil well with butter or margarine. In a small bowl add flours, salt, xanthan gum and baking powder and mix well. Set aside. Beat egg whites until they are stiff enough to stand in peaks. Set aside. In a large bowl add egg yolks, sugar, vanilla and almond extracts and water. Mix well. 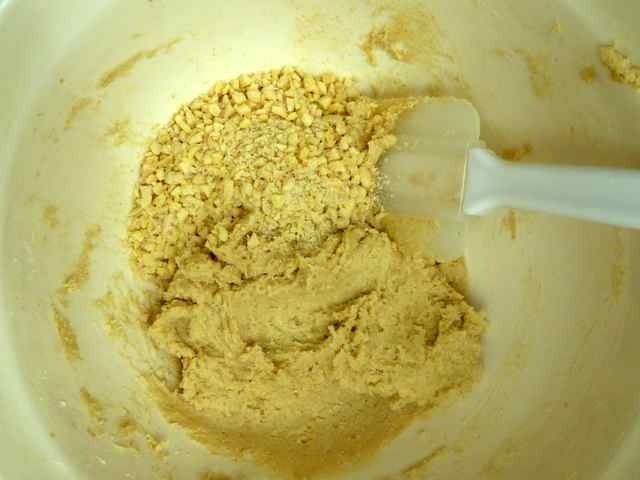 Add the flour mixture to the egg yolk mixture and mix together well. Fold the beaten egg whites into the egg yolk/flour mixture. Folding stiff egg whites into the batter. 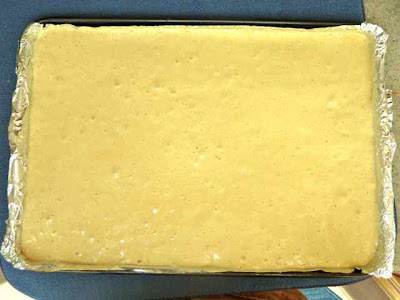 Raw batter in the foil lined jelly roll pan. 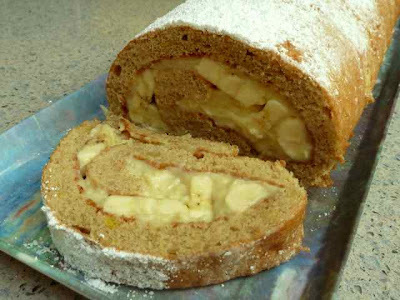 Bake until the cake is golden and springs back when pressed lightly with a finger. Approximately 12-15 minutes depending upon the oven. While the cake is baking prepare a smooth dishtowel by laying it out on the countertop and dusting it well with confectioner’s sugar. 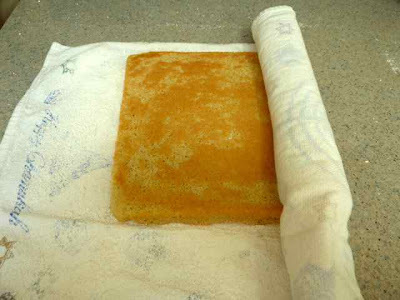 When the cake is done, remove it from the oven and immediately invert the cake on to the prepared dishtowel. While still hot roll the cake up in the dishtowel starting from the narrow end. a dishtowel dusted with confectioner's sugar. 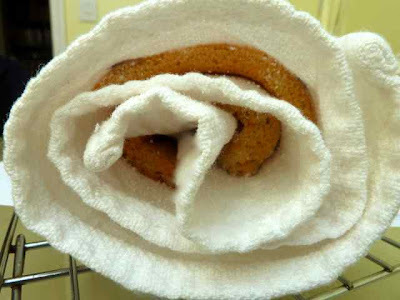 Allow the cake (still rolled up in the dishtowel) to cool completely on a rack, seam side down. I usually line the rack with paper to prevent the rack lines from indenting the cake. 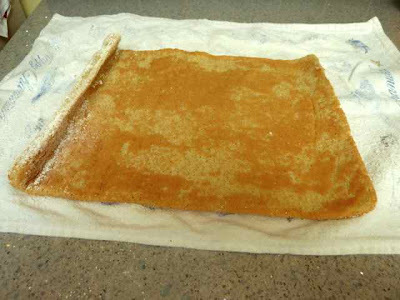 Rolling the cake while hot and allowing it to cool while rolled up will prevent the cake from breaking when you fill it and re-roll it. 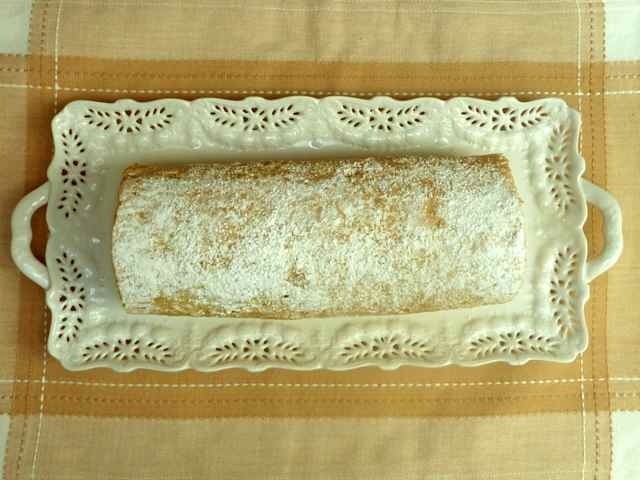 Cake rolled up in a dishtowel cooling on a rack. To prepare the strawberry filling, first clean and cut the strawberries into large pieces. 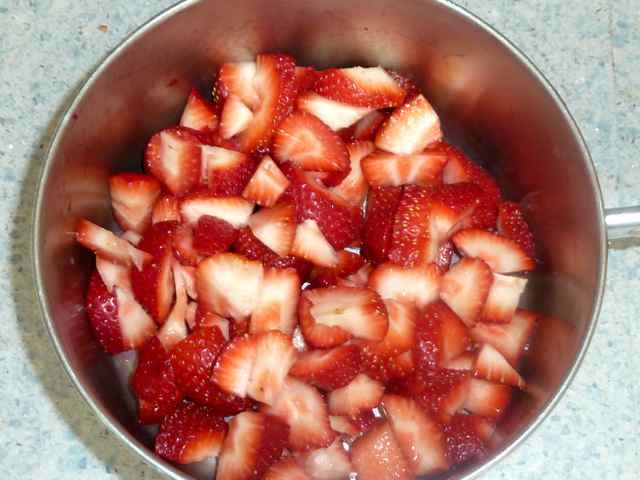 Strawberries, cleaned and cut into pieces. Add the strawberries, sugar, tapioca or corn starch and water to a large saucepan. Mix well. 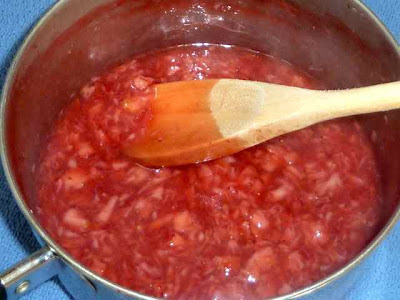 Strawberry mixture cooking. Note that the liquid is still cloudy. Cook over medium heat stirring often and crushing some of the fruit with the back of the spoon. The filling is done when the corn or tapioca starch is no longer cloudy. Remove from the heat and allow the filling to cool completely. Set aside. Note that the cloudiness is gone. Whip the heavy cream until slightly thick, add the sugar and vanilla and continue to whip until thick. Do not over beat or you will have butter. Spread the strawberry filling evenly over the cake. Cake spread with strawberry filling. 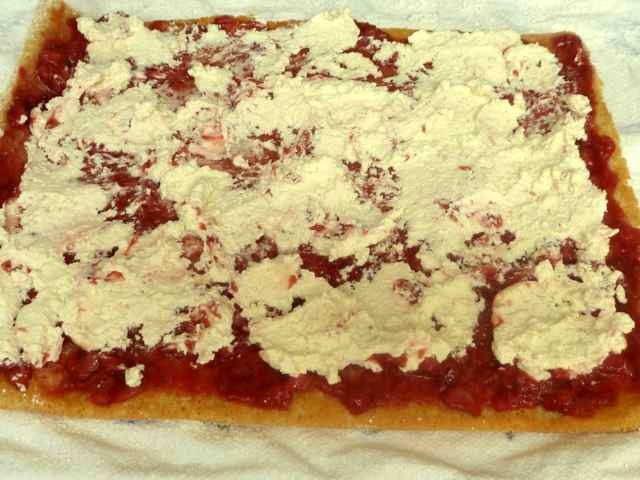 Top with the whipped cream and do your best to spread the whipped cream evenly over the strawberry filling. It will not be perfect to look at, but will taste great. Whipped cream spread as evenly as possible. Re-roll the cake. 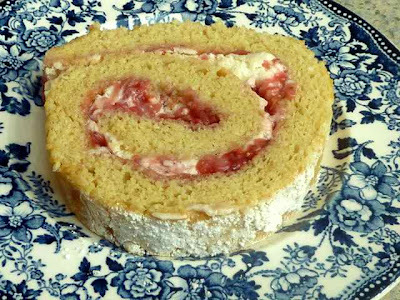 Carefully roll the cake making sure it is rolled tightly enough so that there are no spaces or gaps. Trim the ends if you like a more finished looking cake. Move the cake to a platter and dust with confectioner’s sugar. Cake dusted with confectioner's sugar. You can freeze the cake or pieces of cake and then thaw at room temperature before serving. A slice will take about 20-30 minutes to thaw and a whole cake will take about 1-1 1/2 hours. **A thank you to the Baking Beauties and Allergy Free Alaska for hosting a GF Tuesdays link up event! GLUTEN FREE JELLY ROLL CAKE WITH STRAWBERRY AND WHIPPED CREAM FILLING Ingredients CAKE 4 Eggs 3/4 cup Sugar (I use Evaporated Cane Juice Crystals) 4 Tbs. Water 1 tsp. Vanilla Extract 1/2 tsp. 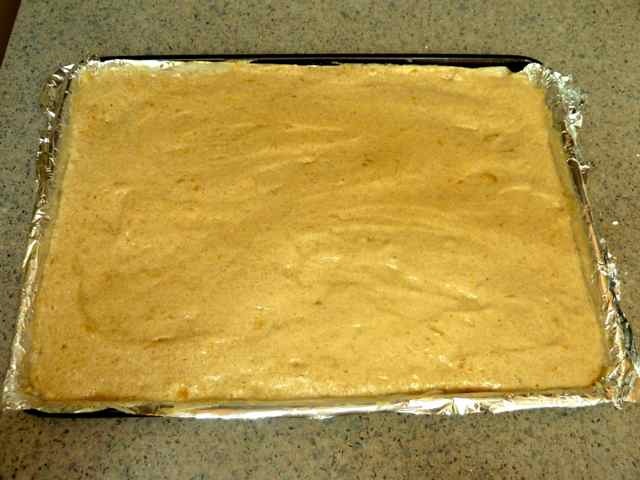 Almond Extract 1/2 cup Sorghum Flour 6 Tbs. Tapioca Flour 2 Tbs. Chickpea Flour 1/4 tsp. Sea Salt 1 1/2 tsp. Baking Powder 1/2 tsp. Xanthan Gum 1-3 tbs. Confectioner’s Sugar for dusting FILLINGS STRAWBERRY 2 cups (pint) Fresh Strawberries - cleaned and cut into large pieces 1/4 cup Sugar (adjust to taste depending upon the sweetness of the fruit) 1 Tbs. Tapioca or Corn Starch* (*I have been using tapioca starch lately in place of corn starch due to a concern about whether corn starch is GMO free or GF safe. I find it works the same as corn starch in sauces and baked goods.) 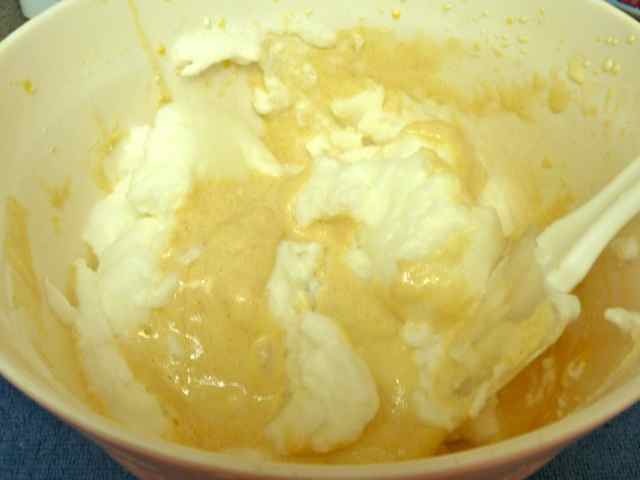 1/4 cup Water WHIPPED CREAM 1 cup Heavy Cream 1 Tbs. Confectioner’s Sugar 1 tsp. Vanilla Extract Directions Preheat oven to 375 degrees. 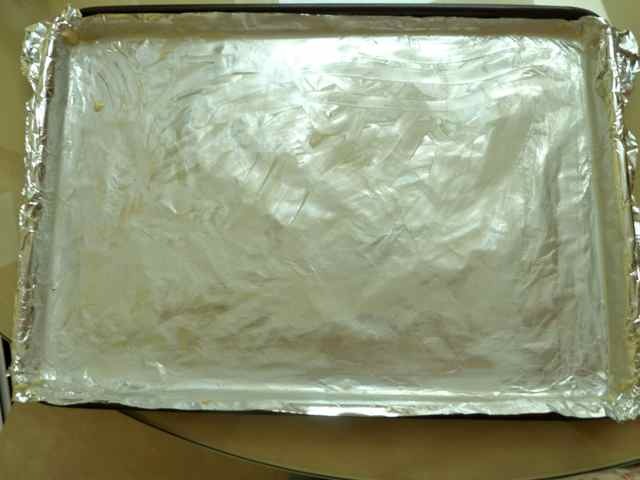 Prepare a Jelly Roll pan (10x15x1-inch) by lining it with aluminum foil and greasing the foil well with butter or margarine. In a small bowl add flours, salt, xanthan gum and baking powder and mix well. Set aside. Separate eggs. Beat egg whites until they are stiff enough to stand in peaks. Set aside. In a large bowl add egg yolks, sugar, vanilla and almond extracts and water. Mix well. Add the flour mixture to the egg yolk mixture and mix together well. Fold the beaten egg whites into the egg yolk/flour mixture. Spread the batter evenly into the prepared Jelly Roll pan. 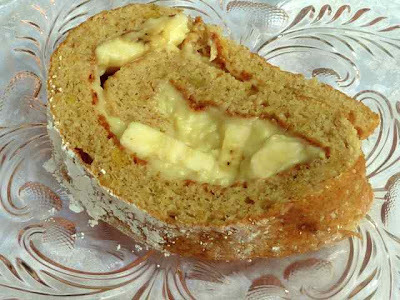 Bake until the cake is golden and springs back when pressed lightly with a finger. Approximately 12-15 minutes depending upon the oven. 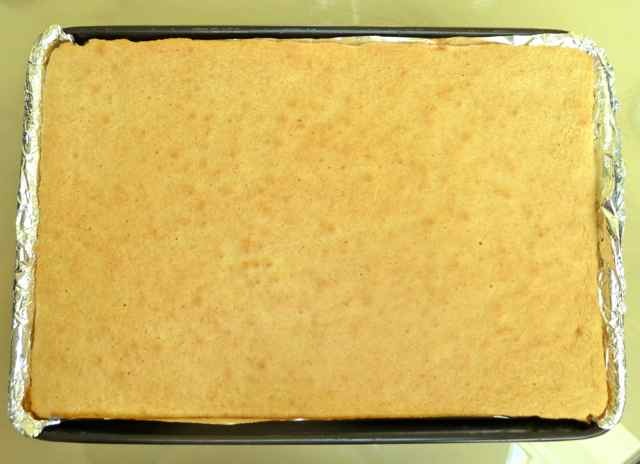 While the cake is baking prepare a smooth dishtowel by laying it out on the countertop and dusting it well with confectioner’s sugar. When the cake is done, remove it from the oven and immediately invert the cake on to the prepared dishtowel. 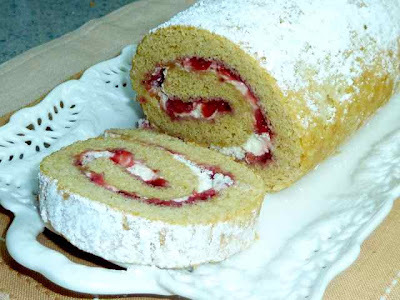 While still hot roll the cake up in the dishtowel starting from the narrow end. 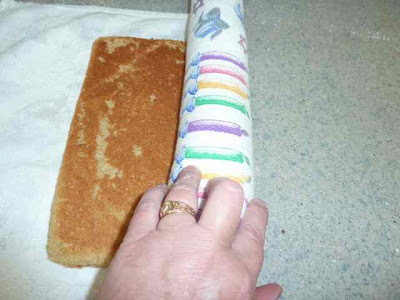 Allow the cake (still rolled up in the dishtowel) to cool completely on a rack, seam side down. I usually line the rack with paper to prevent the rack lines from indenting the cake. 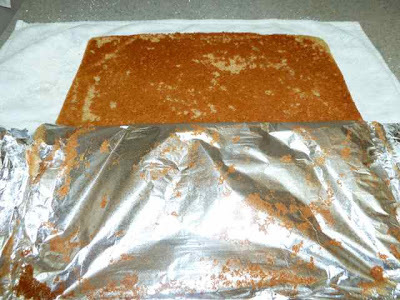 Rolling the cake while hot and allowing it to cool while rolled up will prevent the cake from breaking when you fill it and re-roll it. To prepare the strawberry filling, first clean and cut the strawberries into large pieces. 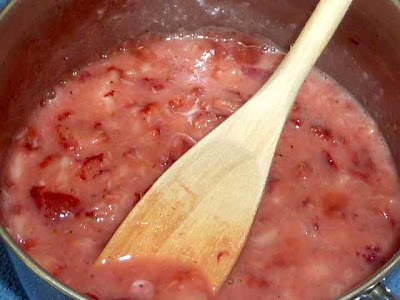 Add the strawberries, sugar, tapioca or corn starch and water to a large saucepan. Mix well. Cook over medium heat stirring often and crushing some of the fruit with the back of the spoon. The filling is done when the corn or tapioca starch is no longer cloudy. Remove from the heat and allow the filling to cool completely. Set aside. Whip the heavy cream until slightly thick, add the sugar and vanilla and continue to whip until thick. Do not over beat or you will have butter. ASSEMBLING THE CAKE Unroll the cooled cake. 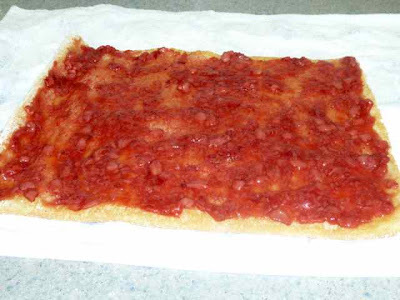 Spread the strawberry filling evenly over the cake. Top with the whipped cream and do your best to spread the whipped cream evenly over the strawberry filling. 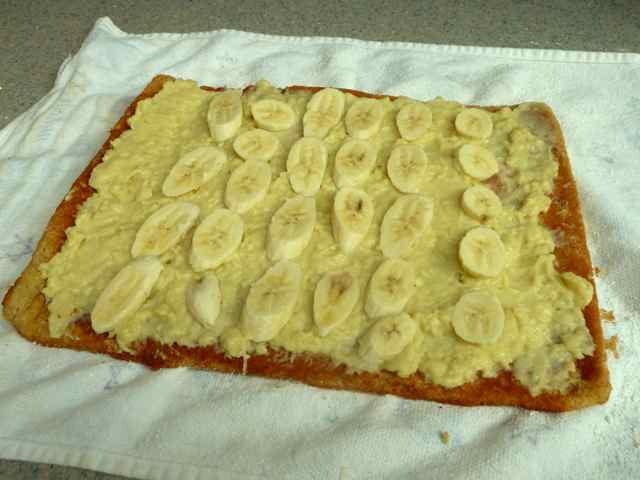 It will not be perfect to look at, but will taste great. Re-roll the cake. Carefully roll the cake making sure it is rolled tightly enough so that there are no spaces or gaps. Move the cake to a platter and dust with confectioner’s sugar. Cut into pieces to serve. You can freeze the cake or pieces of cake and then thaw at room temperature before serving. A slice will take about 20-30 minutes to thaw and a whole cake will take about 1-1 1/2 hours.